Relax. The truth is, you’re not going to run out of heating oil. Why? Smart Touch Energy will keep you fully supplied all winter long. Our full-service methods ensure you have the energy you need to keep the heater operational when you need it most. Smart Touch Energy offers several heating oil delivery options to keep you fully supplied year-round. To avoid running out of fuel oil, consider opting into one — or a few — of these four service solutions. Our Auto Fill Program is ideal for the homeowner who never wants to worry about their fuel supply again. We set you up on our regularly scheduled program to keep your energy in perfect supply all season long. To get started, our expert technicians will collect detailed information about your home and heating needs. We use this data to create an accurate estimate of your heating oil needs and determine when you will be due for additional supply — meaning you don’t have to worry about calling us. Our smart algorithm allows us to determine when you need a delivery. We’ll contact you well in advance of the estimated due date, so you can still schedule service at your convenience. As a bonus, you’ll receive a discounted rate for using our automatic delivery service that saves you an additional $0.03 per gallon of oil. We require no contract for this service, so you can cancel any time. Smart Touch Energy knows today’s consumers. Most prefer to purchase heating oil online, so we’ve made this task convenient and user-friendly. Our website makes it easy to buy heating oil online whenever you’d like. You can also use our system to manage your home heating deliveries quickly and efficiently. Track your delivery from the moment you place your order until the truck arrives at your home. Our convenient online heating oil management also allows you to pay your bill, manage your account and set up a unique energy profile for your services. With Smart Touch Energy’s online ordering service, you can shop for energy 24/7 — no more phone calls, wait times or leaving the comfort of your home. Simply visit our website, check the pricing and place your order. Within 24 hours, you’ll receive a confirmation email from your local dealer. Then, your oil will arrive within three business days — some orders may even make it to your door the same or next day. What If You Still Run Out of Heating Oil? Emergency Delivery Service: Through this service, we can get you the fuel you need, typically in 24 hours or less. When we make emergency oil deliveries, we also perform any priming or restart procedures necessary to clear your fuel lines and get your home’s heating system safely operating again. 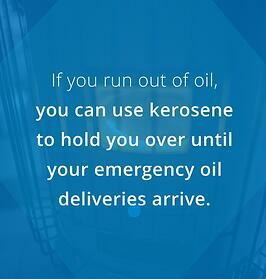 Kerosene: If you run out of oil, you can use kerosene to hold you over until your emergency oil deliveries arrive. This can be purchased at most gas stations. Be sure to use an appropriate gas container for your kerosene. Typically, five or 10 gallons will be enough to last a day or two until your regular supply arrives. Diesel Fuel: Another emergency-supply option is diesel fuel. Again, make sure you have a container that is suitable for flammable products. Go to your local gas station and purchase five to 10 gallons of diesel fuel. When you fill your oil tank with the diesel, allow 10 minutes for the fuel to settle in the tank before you restart your system. This gives impurities and sediments time to settle at the bottom of the tank. Insulated Surroundings: To conserve heat as you wait for your emergency heating oil supply to arrive, take steps to insulate your home. Ensure all windows and doors are securely closed. Use insulating methods, such as weather stripping and draft blockers, to maintain a warm interior. Maintenance Check: If you think you’ve run out of heating oil, verify this is the issue. If you have no heat, it could be due to another problem. Is your fuel line blocked? Is your oil burner operating properly? If you do in fact have oil, contact your heating contractor as soon as possible to determine what the issue is and make the necessary repairs. Alternative Sources: If you have run out of heating oil or are experiencing maintenance issues, consider using a supplemental heating source for the time being. Space heaters, fireplaces and wood stoves are a few potential sources of heat. Make sure you follow safety precautions when you use these sources. Smart consumers who are concerned with ample fuel supplies are also generally on the look out for ways to save money and extend their oil supply. Heating the home typically makes up at least 70 percent of your household’s energy use. When you take heat-saving measures, you’ll be able to stay comfortable, reduce your energy consumption and costs, require fewer heating oil refills and reduce the workload of your heating system. Layer Up: An effortless way to reduce your energy consumption is to dress warmly during colder weather. Rather than pile on bulky layers, use multiple thin layers. This provides better insulation and allows you to add and remove layers easily to remain comfortable. Rather than cranking up the thermostat or constantly adjusting the heating settings, add or remove a layer of clothing instead. Warm Your Toes: If your feet stay warm, the rest of your body is more likely to remain comfortable. Invest in some warm socks or slippers you can wear while at home. Slipper socks are comfortable and cozy, not to mention they can help save money on your heating bill. Choose Hot Foods: Try cooking more often during the colder months. The heat from the oven and stove will help warm up your home. Consuming hot foods will also keep you warm. Save ice cream treats for summer and opt for a cup of hot cocoa instead. Eat warm soups rather than cold sandwiches. You’ll be less likely to reach for the heating controls and burn up more oil to recover from a frosty dessert or cold meal. Drown the Cold: You’ve probably heard it’s good to drown a cold by drinking lots of fluids when you’re sick. Did you know this tip works for fighting the cold weather, as well? If you’re well-hydrated, you can tolerate frigid temperatures better. To get a double dose of warmth, drink hot beverages like tea and coffee to help you get your full dose of water intake each day. Skip the Schnapps: A common misconception is that alcohol will help warm you up. In fact, consuming alcohol drops your core body temperature. If you want to sip a hot beverage to stay warm, that’s great — just don’t spike it. Don’t Waste the Baking: If you do any cooking in the winter, keep in mind you can use the residual heat created by your oven. 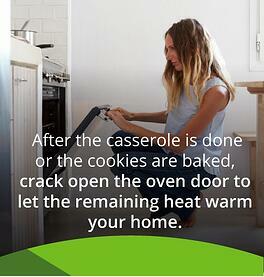 After the casserole is done or the cookies are baked, crack open the oven door to let the remaining heat warm your home. Be sure to keep safety in mind if you use this method, especially if you have small children or pets in the home. Cultivate Heat With Curtains: Do your rooms get a lot of sunlight? Be sure to use your curtains to properly capture heat and keep it in your home. Open window treatments during the day to let sunlight in your home. This natural lighting is a free source of energy to heat your rooms. Then, at night, close the curtains to keep the warm air in and the cold air out. Consider using drapes with insulated backing, noise-reducing or light-blocking qualities, as these will regulate the temperature and keep your rooms warmer. Change Your Turn-Down Service: What blankets and sheets do you use during the winter? Make your bed a warm and toasty place for sleeping, so you can turn down your heat at night. The cooler temperature is better for sleeping, and it will help you save on energy bills. Pile on an extra blanket, or two or three and switch to flannel sheets during colder months. Warm Up Before You Lie Down: To make cooler night temperatures more tolerable, warm up your bed before hitting the hay. Use warming stones to heat up the bed before you turn in for the night — you can also use a hot water bottle. The goal is to make your bed a toasty-warm place to snuggle into each night. Cap Your Heat Loss: Did you know a hat can greatly increase your level of warmth? During frigid days, wear a close-fitting cap to prevent heat loss in your body. Paired with layered clothing, this extra step can greatly reduce your need for higher temperatures in the home. Throw Heat Around: Do you own any small blankets? These throws are great to keep around the home in convenient locations. Have them at the ready to grab if you feel chilled. Make it a habit to grab one if you’ll be sitting for a long period. You’ll stay warm without turning up the thermostat and using more energy. With a nice, soft blanket, you’ll be comfy and cozy, too! Humidify Your Home: Moist air is warmer than dry air. Use a humidifier in rooms where you spend significant amounts of time. For best results, set the humidifier to 40 percent humidity. This will help keep the air warm but not so moist that it encourages mold growth. Shower Your Home With Warmth: During and after a shower, you probably run the bathroom fan. In the winter, leave the fan off and open up the bathroom door after you shower. This will spread the humidity generated to the rest of your home, which will help to warm the entire house. You’re already paying for the water, so why not use the additional heat source it provides and save your heating oil? Reverse the Air Flow: Do any of your rooms have ceiling fans? If so, be sure to switch these to “winter mode.” Most ceiling fans include a switch you can flip to reverse the direction of the blades. Rather than create a breeze to cool you, they will push warm air back down to the ground where you want it. This recirculation can help keep your rooms warmer without burning more heating oil. Cover Bare Floors: Hardwood and tile floors are much cooler than carpeted areas. 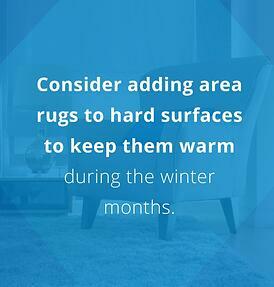 Consider adding area rugs to hard surfaces to keep them warm during the winter months. Large area rugs in living rooms and small mats in the kitchen can make a dramatic difference in the comfort level of your feet. Keep those toes warm, and the rest of you will stay warmer, too. Dodge the Draft: Do you feel any cold drafts in your home? Stop these with weather stripping or home-made solutions. Use rolled towels near window frames. Make draft stoppers for door thresholds with a material of your choice stuffed with rice, thick pillow filling or another appropriate insulator. You can get as creative as you want to make your draft stopper personalized and fashionable. Put Out the Fire: A fireplace may be a useful source of warmth for the winter, or it can be a source of heat loss. Use this feature wisely. Be sure to close the flue when you’re not using it, as it can be a significant source of heat loss and chilly air entry for the home. Keep this in mind if you are going to use your fireplace. On particularly cold nights, you may lose more heat through the flu than the fire is generating for the home. It’s usually best to save fireplace usage for cool, but not frigid, times. Clear the Way: Review your furniture and décor placement to ensure nothing blocks your heating vents. You may think it won’t make much of a difference if your couch covers just one vent, but it will! Do some rearranging, if necessary, to let the warm air into the room. This will be a much better use of the heating oil you’re burning than simply warming the back of your furniture. Use Warmers: Hand and feet warmers can greatly increase your comfort without inflating your energy bill. Use dried beans to create a stuffed fabric square. Microwave the warmer for 30 seconds and enjoy instant warmth for your hands and feet. For even more simple heat, make your warmer a full lap pad. Arrange for Warmth: Where is your bed located? What about your sofa? If they’re near a window or exterior wall, consider rearranging — these areas of the home are colder. Moving your bed even a few inches away from the wall can make a significant difference. Program It: Do you have a programmable thermostat? This device offers a huge advantage when it comes to regulating the temperature of your home. Set it to automatically reduce the temperature of your home during the time when you’re away or asleep. Program a comfortable temperature to maintain while you’re at home. The programmable thermostat will reduce waste and lower the amount of energy you use. Place Some Plastic: To further insulate your windows, consider covering them with plastic. A clear plastic film attached to the window frame can help insulate your home against the cold air and keep your heated air inside. To seal the plastic tightly to the frame, use a hair dryer to heat the film. Visit the Second Floor: Many people spend much of their day on the first floor of their homes, or even in the basement. During wintry weather, try spending more time upstairs. Heat rises, so this space is naturally warmer. If you spend most of your time on the second story of your home, you can keep your home cooler and save money on your energy bill. Stay Active: The more you move around, the less likely you are to be cold. Try to remain active during the winter. While it’s tempting to curl up under a blanket for the day to try to avoid the winter, physical activity can keep you even warmer. Do some cleaning, exercise or complete a home project. Find an activity that’s useful or enjoyable to keep your blood circulating and your heating bills low. Insulate the Place: How well is your home insulated? Older homes are especially likely to have poor insulation. You might be losing a ton of heat through your attic, walls or crawlspace. On average, about 25 percent of your heat is lost through the roof. Consider adding better insulation to your home to reduce the amount of energy you use each winter. Pack on the Snacks: After the holidays, many people focus on eating healthy to lose weight. With that in mind, this might be a hard tip to apply for the winter. However, if you eat more, your body will stay warmer. At freezing temperatures, your body requires more fuel to keep your internal temperature up. If you eat high-fat foods, these slow-burning fuels will keep your body warmer. Try keeping a few of these snacks on hand to avoid getting chilled. Look to the Sun: If you’ll be spending time in your home during the day, find a sun-lit spot to set up camp. Why sit in a cold, dark corner and raise the heating bill? Use natural heat to stay warm by sitting in a sun-filled room. If necessary, rearrange the furniture so seating is in the sunlight for as much of the day as possible. While you can use these tips to reduce your energy consumption and save money on utility bills, you’ll save even more time, money and effort by contacting Smart Touch Energy for your heating oil needs. Our economic heating oil prices and superior customer service will both reduce your energy costs and increase the convenience of your heating services. Our programs offer the best ways to prevent running out of fuel. Check out our current pricing and order oil online today for fast, efficient delivery.